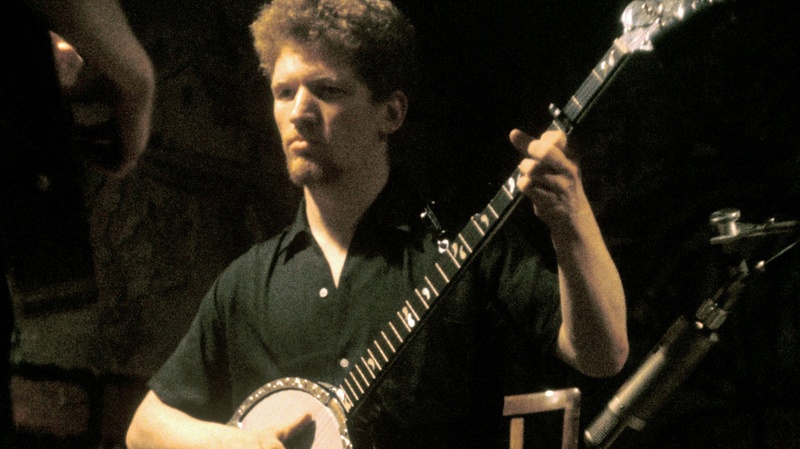 Luke Kelly was Ireland’s best-known folk singer — he was also a lifelong socialist. Luke Kelly at 1964 London performance. Luke Kelly was born in Sheriff Street, one of the best-known thoroughfares of Dublin’s north inner city, in November 1940. For decades the area’s workers had labored on the nearby docks — providing the backbone, thirty years before, for much of Jim Larkin’s organizing efforts. But by the mid-twentieth century, those employment opportunities had begun to decline and living conditions were often poor. Luke was born into a one-room cottage on Lattimore Place with communal toilet and taps shared among eight families. 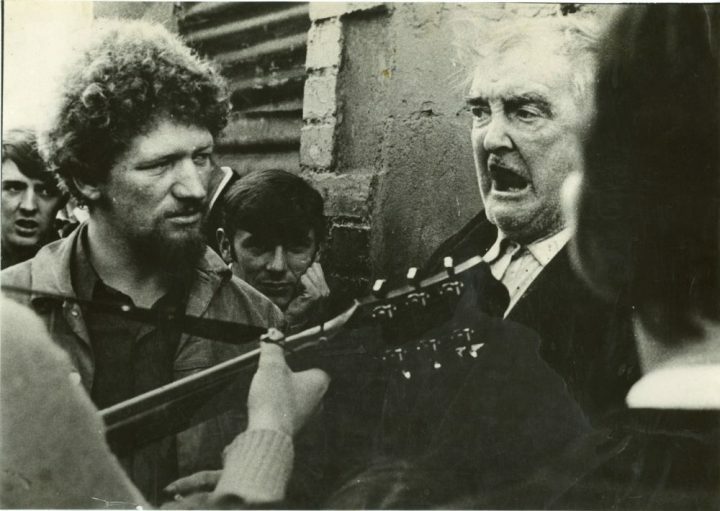 For many in Dublin’s inner city at that time, Des Geraghty remembers in his excellent memoir of Luke Kelly, traditional Irish music was somewhat alien, more a “culchie endeavor” than anything that resonated with urban life. The narrow cultural nationalism which had been espoused by the conservative victors of Ireland’s revolutionary period arguably reached its height in the 1940s, with Taoiseach Éamon de Valera making his famous “Ireland That We Dreamed Of” speech. His narrative of “a land whose countryside would be bright with cozy homesteads” seemed to have little room for aspirations of the working-class. The ‘moral’ Ireland of de Valera’s imagination—Gaelic, Catholic, “living the life that God desired”—had never had much interest in improving the lot of the country’s workers, although they usually paid the cost of attempts to beat the population into its confines. As Luke Kelly grew up and left school at 13, his cultural tastes increasingly kicked against this current. Although he regularly attended Irish céilí dances with his sister Mona, the music he listened to owed more to the sounds of urban America his father had introduced him to — Fats Domino, Al Jolson, Frank Sinatra, Perry Como. He also developed an interest in theater and musicals. A fire forced the family to up sticks to the suburb of Whitehall in 1953, a move that Luke Kelly never adapted to, but despite the requirement to take the bus every day, he travelled regularly to the Marian Arts Society in Dublin’s inner city where he was actively involved in the plays it put on in the Oriel Hall. Although London later became the destination of preference for Irish emigrants, at the time Luke ventured across the Irish Sea the Midlands were a safer bet for work. It was there, in Wolverhampton, that Paddy Kelly performed the duty of many Irish older brothers of years past and since in fixing Luke up with a job and a place to stay. But Luke’s time as a steel fixer on that building site would prove short. After being told by a colleague onsite that others were being paid more for the same work, Luke confronted the foreman to demand a raise. In an incident that his brother Paddy described as naive, but which gave indication of Luke’s budding politics, he was swiftly sacked—and only narrowly avoided having the entire Irish contingent join him. But these years on the road would prove fruitful, with a number of encounters profoundly shaping the Luke Kelly story. The first, in Newcastle in early 1960, would lead him back to Irish music. On an evening he intended to visit a local jazz club, Luke Kelly instead found himself drawn to singing he heard coming from a folk night. There he found a crowd of Geordies reciting The Auld Triangle, the centerpiece of Brendan Behan’s play The Quare Fellow. He recounted years later the pride and enthusiasm he felt hearing a song rooted in the working-class Dublin he grew up in sung with such passion by an English crowd. He began to feel that maybe there was more to Irish music than he had believed during his time at home. After his wilderness years, the Mulreadys provided Luke with a solid base—helping him to, in their words, “clean up and find a job.” He also applied himself to night school where he studied literature and left-wing politics under the Mulreadys and also Marxist classicist George Thompson. Luke would later say that “my interest in folk music grew parallel to my politics,” having met the Mulreadys first through his membership of the socialist Clarion Singers Club, and then in turn coming to learn the banjo while living in their house. But by 1962 the paths of politics and music were beginning to diverge. Seeing great potential in his intellect and application, George Thompson arranged for Luke Kelly to go to university in Prague to further his political development. Availing of this opportunity would almost certainly have meant giving up his musical career—so a choice had to be made. Although still committed to socialist politics, Luke had by this time caught the folk music bug. He turned down the chance to study in Prague and packed his bags for a trip elsewhere, returning to his native Dublin as it was beginning to sway with the winds of the 1960s. 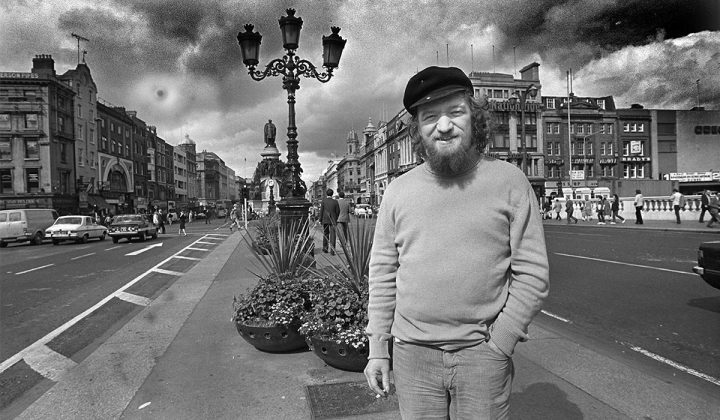 Luke Kelly on O’Connell Steet in Dublin. 5th September 1980. Photographer Donal Doherty. In 1964 The Dubliners released their first album with Transatlantic Records, then the premier folk label. A live album, Luke Kelly was its leading vocalist, singing songs like Wild Rover, Tramps and Hawkers and Home Boys Home which would become staples in the years to come. But the real triumph of the album was his rendition of The Rocky Road to Dublin, a song about Irish emigrants to Britain popularized in the mid-nineteenth century. Notoriously difficult to sing, Luke Kelly produced a masterclass which became the song’s definitive recording. Barney McKenna was later to remark that Kelly was the only singer he’d ever heard to sing the song to the rhythm it was played on the fiddle. Luke continued his political involvement at this time too, becoming more active in the Campaign for Nuclear Disarmament (CND). Again, he found his politics and his musical endeavors very much in tune, adding songs like Ian Campbell’s The Sun is Burning, then the unofficial anthem of the CND, to his repertoire. Under Ewan MacColl’s guidance Luke Kelly also learned numerous workers’ songs, from Schoolday’s Over to Hot Asphalt, as well as MacColl’s classics Dirty Old Town, The Travelling People, Shoals of Herring and Come Me Little Son, each of which Kelly would produce remarkable recordings of in the coming years. The next year, the Dubliners arrived in America, featuring on Ed Sullivan’s St. Patrick’s Day show in 1968. Although they were forbidden from singing Seven Drunken Nights — “you’re not going to sing that immoral song on my show,” Barney McKenna recalled Sullivan saying—their presence was nonetheless remarkable. In the preceding years Ed Sullivan had been working with the intelligence services to ensure no Communists appeared on his show, but it seems in this instance he assumed a folk group from devout Ireland not worthy of investigating. The Dubliners managed a few more good recordings as the decade wore on. The Unquiet Grave on the album Now is beautiful and Parcel of Rogues is an excellent tribute to the best of the Scots tradition, including also a great rendition of 1916 anthem The Foggy Dew. But perhaps the most poignant of them all is the recording of The Auld Triangle, the song popularized by Brendan Behan. Although they never met—Luke played regularly alongside Behan’s brother Dominic, another remarkable songwriter—there was an undeniable connection between Brendan Behan and Luke Kelly. Two Dubliners who brought the wit and personality of the city, as well as the lyricism of its accent, to the world, their lives also illustrate a theme that has come to define the arts in Ireland: the close relationship between creation and destruction. As the 1970s wore on Luke Kelly’s health deteriorated. He spoke, on occasion, about his difficulties with drink, something which seemed totally intertwined with the persona of The Dubliners. In their heyday, it was rare that a Dubliners album didn’t include a picture of a pint on the cover, and much of their material emphasized the role of alcohol in Irish culture. Luke Kelly never fell into moralizing about this—he was always clear how much he enjoyed the many wonderful nights over almost twenty years he enjoyed with The Dubliners on the road, saying he “wouldn’t swap them” even as he came off the drink in later years. And yet the testimony of his colleagues, and those close to him, make clear that there were many times he felt forced to play a role, as though his musical performances could only be complete if they were followed by a river of porter or whiskey in some snug. Although there is no direct connection between this lifestyle and the tumor which was to take his life, Luke Kelly suspected in later years that he would have been diagnosed earlier were it not for his symptoms being mistaken for the quirks of a hangover. As the decade wore on he became crippled by migraines. Ronnie Drew and John Sheahan spoke about Luke forgetting lines, or dates, or places, and none of these drawing too much suspicion. It wasn’t until Luke forgot what country he was in entirely during a trip to Iceland or finally collapsed onstage in Cork in 1980 that alarm bells began to ring. Quick medical intervention saved his life that night, but the Luke Kelly that emerged from the surgery wasn’t the same—he became more reclusive, preferring the care and company of his wife Madeleine to performance. Even struggling with such serious illness, Luke Kelly’s extraordinary talent couldn’t be suppressed entirely. His final years produced two especially beautiful, wistful recordings. The first, a cover of The Kinks’ Thank You for the Days, was a tribute to a rock and roll scene whose biggest stars from Jimi Hendrix to the Beatles and the Who had been keen to meet the great Luke Kelly on his tours to America more than a decade earlier. The second was Song for Ireland, the last song he ever recorded in a studio, his final classic.